Our work is done. Even if the development process turned me gray to my last hair, here it is: the new international version of Bridge Doddle app is now available in the Apple store (iTunes) in the Google Play store and in the Amazon appstore. Click on the badges down here. Now you can play our flashcards in a multiple-choise mode as well. Feel the quiz-feeling and improve your bridge skills beside. The app itself and one first start set is free of charge. 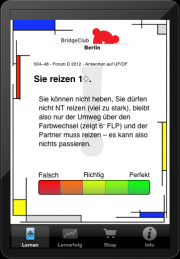 You can choose from more than 500 different in-apps, each system, each skill – in seven different languages. 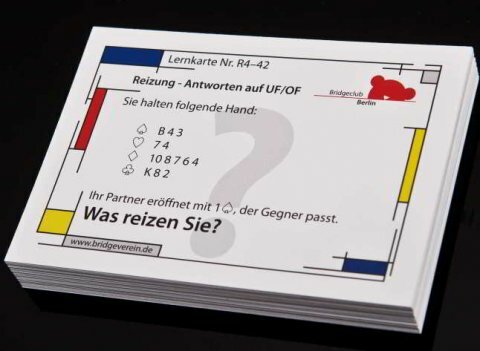 It now includes the new sets for SAYC, Better Minor, ACOL (3 different styles), 2/1, Precision and Forum D 2012 – the most current five-card-major-system of the German Bridge Association. Additional versions for other operating systems will soon follow. Here you can find an overview of all of the sets currently available for the app. We are already offering card sets for all of the most commonly played systems worldwide. For each of these there is a starter set to try out, as well as a few sets for beginners and advanced players. We will endeavour to put at least five new sets online per week, and will do our best to constantly offer new systems and new languages. There will soon be further sets for expert players to really test their mettle. With the latest version of the app it is now possible for us to present complete hands, so that we can offer you challenges for declarer play and defense. Scenarios for end play, squeeze, and the best approaches for suit combinations will also be up and running shortly. Unfortunately the only thing we are unable to influence is Apple’s somewhat time-consuming validation processes. We are also urgently seeking new contributing writers. If you play in your home country at least league level (ideally of course at premiere league level), are familiar with the most common systems used in your country, or even know your way around other commonly used systems, and would be interested in compiling a set, or even better several, on a theme of your choosing – please get in touch with us. You are also very welcome to write the set in your native language! When contacting us though, please write in English or German, and we will get back to you as soon as we can. Additionally, we are on the lookout for distributors and publishers who would like to further develop the printed card sets, or to adapt them for various regional markets. Please contact us to discuss the details..